IntelliMagic Vision for z/OS allows users to view their z/OS data from the application perspective. It recognizes applications and z/OS components like Db2, IMS, CICS, MQ and VSAM RLS, and provides insight in the workloads that keep the mainframe busy. IntelliMagic Vision correlates applications with resources and transactions, providing application centric reporting for regular SMF data. It makes it a lot easier for the z/OS infrastructure staff to understand which applications are using resources like the Coupling Facility and XCF and it gives insight in what might cause delays at the application level. The application view is also very helpful to understand application behavior: to assess whether the processor, storage, Coupling Facility etc. load is indeed as expected. If not, this may be a symptom of a wrong configuration setting causing z/OS or the application to perform too much work, or it may point to an inefficiency in the application. In many cases, such issues are easy to fix once identified. Application reports are specific to the data source. 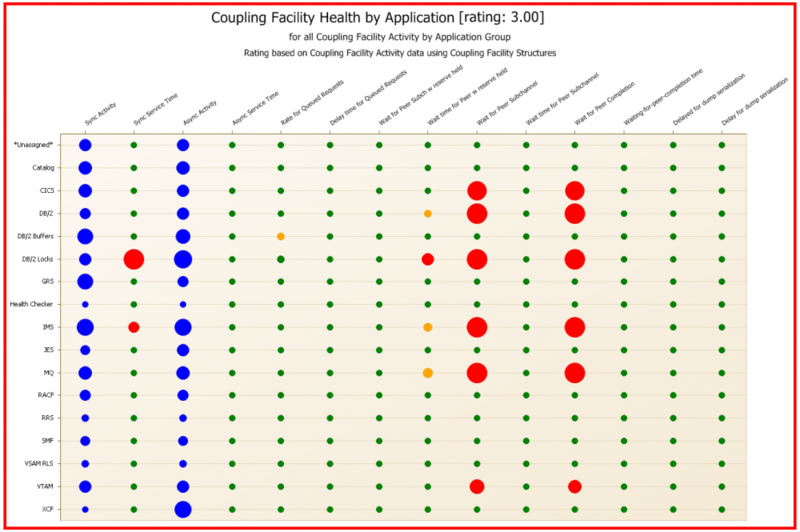 For example, an application report on Coupling Facility Structures will focus on the Coupling Facility usage of the application, and a separate report will show e.g. XCF data. For each of these data sources default rules are provided to highlight activity from many zOS components. First of all, IntelliMagic Vision for z/OS provides reports that break down the overall activity by application. This gives you immediate insight in the resource consumption from your major workloads. The processor, I/O, Coupling Facility and XCF messaging activity will be broken down by application. IntelliMagic Vision also allows you to add your site-specific rules to create insightful reports that match the way you run your business. These rules will not cover everything that matters to your specific site, e.g. it may group test and production CICS regions together, but it should give a good starting point for further customization.